EXCEEDING YOUR FINANCIAL EXPECTATIONS, using the "self-assist" trolleys (trunnion) system. Rig Spacing is quickly changed in less that 4 minutes, LITERALLY SECONDS. In addition, the bar has very little wind resistance and is easier to ship form job to job, too. We can build the Super-Bars to meet any size and capacity for our industry. 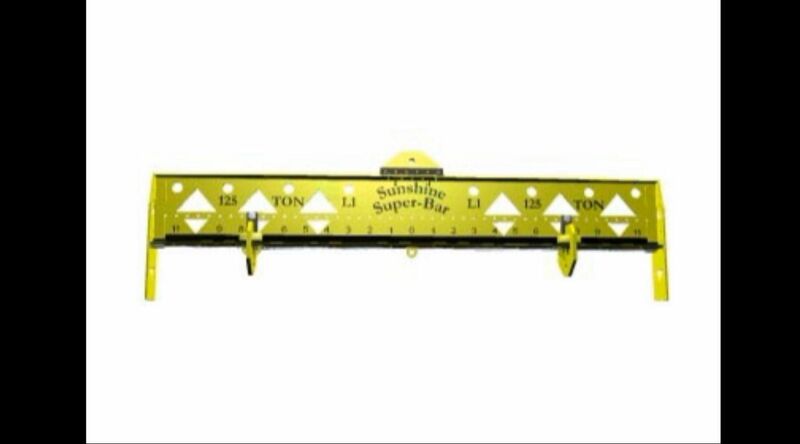 IMAGINE saving thousands of dollars in time and labor costs knowing your spreader bar meets all safety standards and exceeds speed, strength and durability compared to any bar in in existence today! The Super-Bars are the future in accident prevention and a vast improvement to reduce on-the-job safety of personnel and crane hazards. All of our Super-bars meet OSHA 1926.251-Use of Proof-tested Lifters. In addition, each Super-bar meets ANSI Z535.4, ASME Below-The-Hook Lifting Devices Standards, Product Safety Signs and Safety Labels, ISO 3864 and 3864-2 Safety Signs and Colors Standards, and ISO 7000 Graphical Systems Standards.